The process of developing and commercializing high-value new products is one of the most challenging in any business. New product development involves a high degree of risk and uncertainty, requires intensive collaboration among multiple functions, and must successfully balance customer value against time-to-market, cost and quality. It is therefore not surprising that there are many opportunities for waste and inefficiency to impact such a complex environment. 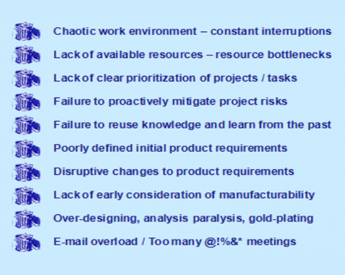 A "top ten list" of sources of waste in new product development is shown in the figure below. The good news is that Lean Product Development addresses all of these sources of waste and more in a practical and easily implemented methodology. Significantly faster time-to-market, consistent with cost and quality goals. More predictable project schedules and launch dates. Use of visual management methods to improve collaboration. Higher profits, due to increased differentiation of new products and better understanding and utilization of voice-of-the-customer. Improved cost and quality, achieved through early and intensive collaboration among marketing, engineering, and production. Rapid and more predictable closure of "knowledge gaps" that require innovative solutions to achieve key customer requirements. Increased agility and flexibility in adapting to changing market needs. Improved capture and reuse of product, market, and process knowledge. Better communication, alignment, and focus at all levels of the organization. Our unique approach to Lean Product Development achieves these benefits by integrating best-in-class practices gathered from over one hundred successful companies, and aligning them with the pragmatic needs of real development organizations. The result is an opportunity to improve your new product development process with minimal disruption, lower risk, and better outcomes over shorter periods of time.